Heat oven to 400°F. In medium bowl, mix flour, baking powder, herbs, salt and baking soda. Cut in shortening, using pastry blender (or pulling 2 table knives through ingredients in opposite directions), until mixture looks like fine crumbs. Stir in buttermilk until dough leaves side of bowl (dough will be soft and sticky). On lightly floured surface, lightly knead dough 10 times. Roll or pat dough about 1 inch thick. Cut with floured 2-inch cutter. On ungreased cookie sheet, place biscuits about 1 inch apart. Brush with butter. Bake 14 to 16 minutes or until golden brown. Immediately remove from cookie sheet. Serve warm. To cut the dough, push the biscuit cutter (dipped in flour) straight into the dough. 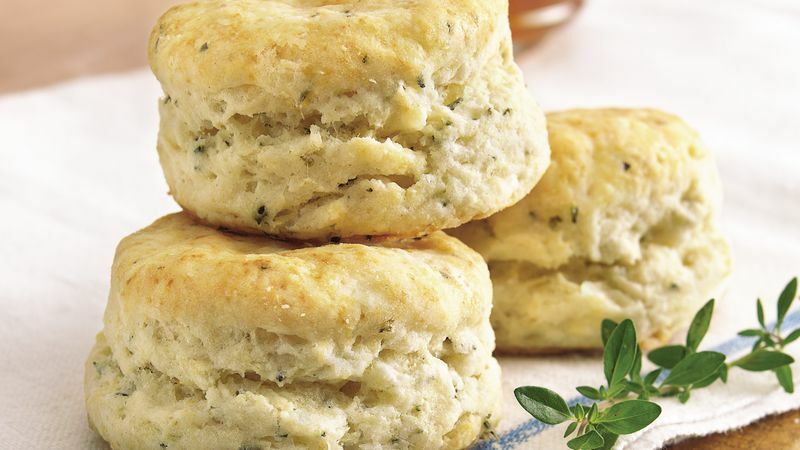 Cut biscuits as close together as possible, and try not to twist as you cut so biscuits will be the same size. Lightly press—but don’t knead—leftover scraps of dough together to cut out a few more biscuits (they may be slightly uneven, but they'll taste just as good).